The lab-to-desk-job culture shock is a real thing. I experienced it, and many of my scientist colleagues have as well. Making the transition from the bench can be jarring for the unprepared, and unfortunately, there aren’t a lot of resources out there for scientists making this transition. In this installment of the Addgene career guide, we’ll think about what causes this culture shock and how to overcome it. What causes the lab → office culture shock? The sense of being the first to discover something. The thrill of having an experiment yield clear results and being the first, and for a very brief period of time, the only, person to know a brand new fact is often enough to keep a scientist going through even the worst experimental dry spells. Losing that sense of discovery can be hard since it’s frequently why many people get into science in the first place. The feeling of camaraderie one gets from a well-functioning lab team. Obviously not everyone gets this feeling out of their lab, but for many graduate students and postdocs, the people you see in your bay for 8-12 hours a day become your family. I talked to a graduate student at a networking event recently who referred to her lab as her family three times during a 10 minute conversation. Leaving a tight-knit team like that can and will be a little gut-wrenching, but you can get that feeling of camaraderie again in a non-academic career. You might not be in a lab anymore, but you will very likely be on a team that supports you when you need it. The opportunity to be creative and think critically. One of the very first times I interviewed a job candidate for a senior scientist position at Addgene, the skeptical applicant asked if she would partake in “critical thinking” in the position to which she was applying. I probably did not respond to her question as well then as I would now. I would have to repress laughter if I was asked that question today, because I sometimes wish for a stretch of time that doesn’t involve critical thinking. Former Addgenie Jessica Welch says, “[It] seems counter-intuitive, but I find office work more mentally challenging than lab work at times.” Sometimes a desk job is defined as sitting down at a computer and just creating, which for many scientists is the most enjoyable aspect of their chosen career. What should you expect during the lab → office transition? I’ve already provided a few counterpoints to some of the causes of culture shock above, but after polling some Addgene colleagues, we’ve come up with a list of things to consider as you make this transition. Of course, a “desk job” could entail any number of career paths--industry, nonprofit organization, law office, journal editor, etc.--so everyone’s experience will be a little different. Some of these changes you may enjoy immediately and some of them may just take some getting used to. Just remember: change is good. You can experience a real onboarding process. Unless you were really lucky with your academic lab, you probably don’t know what it’s like to be properly onboarded. Most work environments outside of academia provide a formal training regime and the right set of tools to help you do your job as well as possible. It’s in their best interest to do so, sure, but it also eliminates that feeling of floundering one can have when starting in an academic lab. I floundered for a solid year after I started my postdoc! It’s a lot easier to manage your time. As my colleague Mike Lemieux told me, “I find that at a desk, it is much easier to stick to timelines. This is probably because you don't have to worry about experiments taking longer than expected or dealing with unexpected results.” For those of you putting in 12 hour days at the lab, I encourage you to think about how much of that time you’re actually spending doing work. Yes, you may legitimately need to be in the lab that long because of the nature of your time course, but you’ll inevitably have downtime and plenty of it. That’s not the case at an office job. I’ve frequently told job candidates over the years that one of the things I enjoy about Addgene is that I’ve never been bored. There is always something to do and there is no thumb twiddling. But you like the downtime, you say? Do you know what’s even better? Going home at 5 o’clock. You’re going to have to talk and interact with...non-scientists! Maybe you’ve just spent 5-10 years learning to “speak science,” and virtually every person you talked to during the day was also a scientist. But now you also need to talk to Tony from legal, Lucy in finance, and Wu in graphic design. You could dread these interactions, but you could also embrace them. Talking about science to non-scientists can be a fun and gratifying challenge. You’re also getting the opportunity to learn their “language”, and in doing so you may discover that your career options are expanding. As someone who coordinates cross-team projects at Addgene, I find that my vocabulary improves on a weekly basis. There will be meetings. And some more meetings, and probably a few more. That’s the way many office jobs work. It took me a long time to come to realize that meetings were not something that took me away from my work. The meetings often are the work. Will Arnold, one of the newer members of our Scientist team says, “a well-run meeting where everyone has a voice and the group can come to a mutual agreement is an amazing thing to be a part of and really helps me get behind a project or initiative.” If you think the meetings you’re attending are a waste of time, do what you can to fix them, and take a look at these tips from the Addgene blog. You’ll have the opportunity to discover and evolve your transferable skills. Transferable skills are the non-technical skills you pick up wherever you work, and you’ve almost certainly developed some in the lab whether you realize it or not. These skills might include collaborating, managing, and communicating. 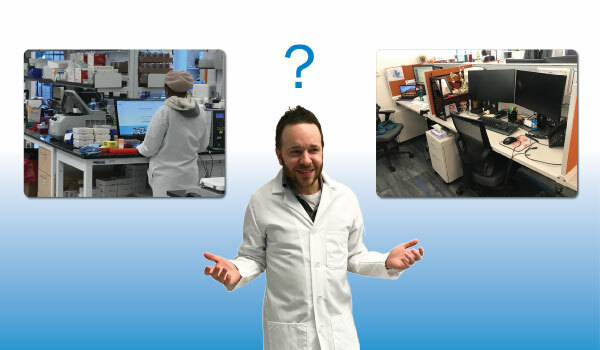 After years of focusing on my technical skills with cloning and lentivirus production, I didn’t really start to recognize my transferable (or “soft”) skills until I was out of the lab and in an office environment. Ultimately, it will likely be these skills that get you your next job or promotion. Also, don’t wait until you’re out of the lab to think about these--get started with our Transferable Skills Guide. Over the last decade, my peers and I have tried to move away from calling non-academic careers and desk jobs “alternative careers.” Realistically, based on the numbers of PhDs and available positions alone, it’s the academic jobs that have become more of a rare alternative. That’s not always an easy reality to accept for young scientists who thought they would be working in a lab for their entire career. Yet even success in academia means you’ll eventually end up as a PI working what is essentially an office job. One way or another, the move from lab to office will likely happen eventually. If you approach that transition dreading the change, the adjustment period will be that much longer. If you approach the transition embracing the opportunity for growth, you can tap into curiosity that led you into science in the first place. Finally, if you still find the idea of not holding a pipette again upsetting, there are ways to get back to the bench during your off hours. DIY bio labs are cropping up in cities around the world, such as BosLab here in Boston. Organizations like this one are always looking for scientists who can volunteer their time to share their knowledge with the community (and sometimes conduct their own independent research!). There are also organizations like Science from Scientists, which try to bring real scientists into schools to provide students with hands-on lab opportunities. You can get your hands in nitrile gloves again! The opportunities are there once you start looking for them. Big thank you to Jessica Welch, Mike Lemieux (for his advice and for modeling in the picture above), and Will Arnold for their ideas and tips!